East Bay Veterinary Hospital has been providing Merrick, Bellmore, and the surrounding communities with first-rate veterinary care since 1988 (25 years!). Our clients are people seeking a convenient, up-to-date, and clean practice where a friendly and knowledgeable staff can meet all the needs of their pet. Along with excellent wellness and preventative care, we are equipped and excel at managing many hardships you and your pet my face. In the event of an illness that requires hospitalization, chronic care, surgery, or chemotherapy, we are ready to provide top-notch care. We offer advanced diagnostics such as ultrasound, echocardiograms, digital radiology, and endoscopy. Our veterinarians have received the necessary training and are skilled in superior dental procedures and delicate soft tissue surgery. A board certified veterinary surgeon is available on-site for advanced soft tissue and orthopedic surgery. In addition, our veterinarians aim to be available at any time if you should have an emergency involving your pet - just call! Being a full service facility, EBVH also offers boarding, bathing, grooming (Pampered Paws) and day care. We take great pride in all we do at EBVH and are honored to help you care for your loved companions. 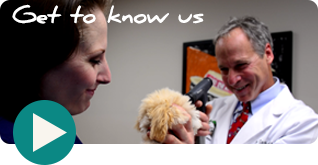 As our patients are cared for like our own pets, our clients quickly become our friends. Welcome to East Bay Veterinary Hospital! At East Bay Veterinary Hospital, we treat your pets like the valued family members they are. I just wanted to say that I love the place! I have five pets and they are all very happy to come and see doctor Selmonsky and staff. I feel very comfortable leaving my pets at East Bay Vet when I go away on vacation. Thanks East Bay Veterinary Hospital!